Located on France’s eastern border, the Rhône-Alpes is named after the Rhône river and the Alps mountain range, and is made up of the following departments, clockwise from the north-west: Loire, Rhône, Ain, Haute-Savoie, Savoie, Isère, Drôme and Ardèche. This region is probably best known for its ski resorts, however, particularly in Savoie and Haute-Savoie, which draw more British skiers and snowboarders than anywhere else, and attract many prospective second-home owners. But there’s more to the Rhône-Alpes than winter sports, and it is an area of dramatic contrasts, from its breathtaking mountains, including France’s highest, Mont Blanc, and its lakes, river valleys and rolling lavender fields, to its renowned thermal baths and the economic, gastronomic and cultural hotspot of Lyon, France’s second city. Add to this the vineyards producing world-famous wines such as Beaujolais, Chardonnay and Pinot Noir, and many beautiful towns and villages, and it’s easy to understand what makes this area so attractive, both to tourists and property hunters. While Savoie is primarily known for its world-famous ski resorts, its capital, Chambéry, with a high student population, is a lively, bustling city with a vibrant café culture, plenty of monuments and fountains, and several important museums. Savoie boasts no fewer than sixty ski resorts. Three of the best known can be found in Les Trois Vallées, the largest ski area in the world, and they are Courchevel, Meribel,and Val Thorens. At 1850m, Courchevel is the highest resort, and it’s also the smartest and most expensive, with a wide choice of ski and snowboard schools and plenty of gentle, beginner slopes. Meribel is the party resort, with live music, comedy and clubbing until the early hours, while Val Thorens is purpose-built, with easy access to the slopes and a vibrant après-ski scene. Formerly known as Espace Killy, Val d’Isère-Tignes is a hugely popular skiing area and, together with Les Trois Vallées, ranked as the highest-rated in France, due to its variety of runs, reliability of snow, gastronomy and après-ski. Val d’Isère is ideal for intermediate skiers, with a more varied terrain than other world-class resorts, several ski schools and some quieter outposts. With a village altitude of 2,100m and highpoint of 3,455m, neighbouring Tignes is open for skiing for up to ten months of the year, and both resorts combined offer 300km of pistes. The eastern part of the Haute-Savoie department is ‘high Alps’ country’, and includes Mont Blanc, the highest mountain in France. 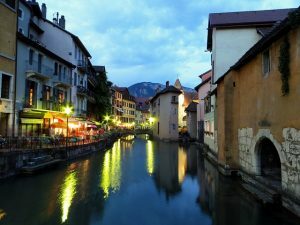 The lakeside city of Annecy, its capital, is one of the most popular cities in the Alps, teeming with historic buildings and bridges crossing the river Thiou, at 3.5km one of the shortest rivers in Europe. Lake Annecy attracts a great many visitors, who enjoy its beaches, its boats and water taxis, and of course its stunning backdrop. The department is principally known for its winter sports, however, with some fifty ski resorts, including Chamonix, Megève, Morzine, La Clusaz and Saint-Gervais. There are also over forty cross country skiing areas. In the summer the department lends itself to mountaineering, hiking, biking, horse-riding and water sports. Gastronomy here is based on cheese and potatoes dishes, such as Tartiflette, Raclette and Fondue. Among the cheeses produced here are Abondance, Reblochon, Tomme de Savoie, Tomme des Bauges and Sérac. In the north-west Rhône-Alpes, the Rhône department is one of the least visited in the region, despite its principal city being Lyon, widely considered one of France’s most interesting cities. 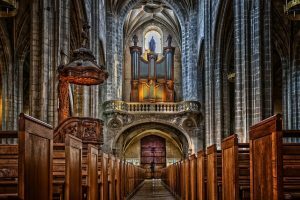 Its 15th century cathedral is listed as a French National Monument, and its Fine Art Museum has one of the largest collections of art after the Louvre. Lyon is also considered France’s gastronomic capital, being a hub for high quality regional produce. With almost 2000 eateries, the city boasts one of the highest concentrations of restaurants per capita in France. Around fifteen of them are Michelin-starred, but more accessible are its ‘bouchons‘, or family-run bistros, which are unique to Lyon and serve home-made, traditional dishes. Specialities include quenelles, typically a mixture of creamed fish, a variety of sausages and desserts such as bugnes, a type of donut, and the Coussin de Lyon coloured sweets. Beaujolais wines are also produced in Rhône. Isère, with the alpine city of Grenoble as its capital, has around twenty ski resorts, some of which are situated in the Ecrins National Park, a protected area visited by some 850,000 people a year, with mountains and glaciers popular with climbers and hikers. For skiing enthusiasts the Deux Alpes and the Alpe d’Huez are two of the oldest and most popular resorts, while the climb to the Alpe d’Huez, with its 21 hairpin bends, regularly features on the Tour de France, and provides a gruelling summer challenge for around a thousand cyclists every year. The Grenoble walnut is celebrated here, and used in many dishes, with walnut oil and even walnut wine available. The Gratin Dauphinois is also a speciality of the region, combining potatoes with cream, milk and Gruyere cheese. Saint Marcellin cheese and Chartreuse liqueur are also produced here. The Ardèche is one of France’s most loved tourist destinations, both by the French and foreign holidaymakers. It is characterised by unspoilt nature and wonderful scenery, with river gorges, waterfalls, mountains and caves, and offers a large choice of activities, including rock climbing, canoeing and kayaking. Its capital, Privas, is the smallest prefecture in France, with just 10,000 residents, but has pretty architectural features, such as a 15th century bridge and tower. The streets are lined with chestnut trees, and there are festivals every October. Chestnuts provide a distinct local gastronomy, including the sweet crème de marrons and savoury cousina, or chestnut soup. Vineyards include Saint-Péray, Bourg-Saint-Andéol and Côtes du Vivarais. The Ain department is the most northerly department in the Rhône-Alpes, and its capital is Bourg-en-Bresse. Home to a part of the regional natural park of Jura, with its mountainous landscapes offering skiing in the Bugey and Gex areas, in the summer this is a popular area for mountain biking, quad biking, hang-gliding, fishing and hunting. The Dombes plateau has around a thousand ponds, and a wide variety of birds, including ducks, pheasants, cormorants, gulls and herons. Culinary specialities here include four famous cheeses – Bleu de Bresse, Bleu de Gex, Ramequin and Comté, while chickens of the Bresse area are renowned. Ain also produces famous wines such as Chardonnay, Gamay and Pinot Noir. 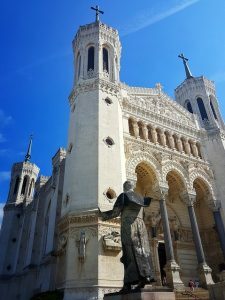 Not to be confused with the Loire Valley, Loire is situated in the north-west of the Rhône-Alpes, and has Saint-Etienne, a lively 19th century city, as its capital. The department boasts a wide variety of scenery, from valleys and tree-covered hills, to springs and gorges, lakes and rivers. 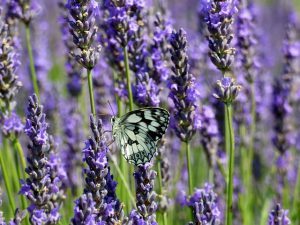 Bordering Provence, the Drôme is best known for its lavender fields and quiet market towns, and for the Vercors Natural Regional Park. Its largest towns include Montelimar, Nyons and Valence, its capital. Drôme has over 20,000 ha of vineyards, and a famous local drink is Clairette de Die, a sparkling wine. Olive oil and other olive specialities are also produced here, as is nougat.